In the following video something simple happens. The problem is that it seems so counter-intuitive that most people will deny it is even possible. So what happens? At the start of the video a car-like vehicle with a large propeller stands still, with a strong wind blowing from directly behind it. The operator of the vehicle releases some sort of brake, the propeller slowly starts to turn, and the car starts to move. The car gradually accelerates until it matches the speed of the wind. (As viewers we know this because we can see a wind vane on a pace car point idly, and hear the wind noise on the videographer’s microphone drop to nothing.) The the “impossible” happens. The car continues to accelerate strongly, until it is going quite obviously faster than wind itself. 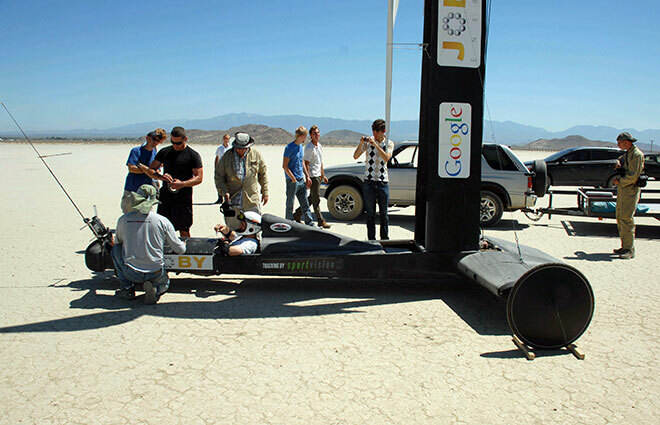 In fact, according to the instrumentation at the test run, the car went about triple the speed of the wind. I don’t doubt what I’m seeing, there’s too much supporting evidence. I don’t know how it is possible though. At least not yet, but I do suspect some variation of the mechanism that allows catamarans and ice boats to exceed wind speeds, though they do it on what is termed by sailors as a “broad reach”, not a “run”. Ride Like the Wind (only faster): Video from Richard Jenkins – World Land Speed Record Holder. 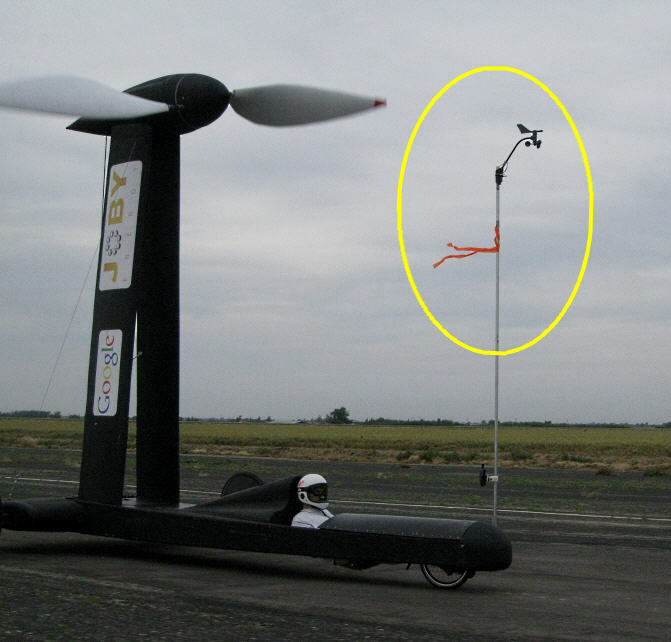 Is it possible to go downwind faster than the wind, in a wind-powered car (or vehicle)? (PhysOrg.com) — A wind-powered car has been clocked in the US traveling down wind faster than the wind. 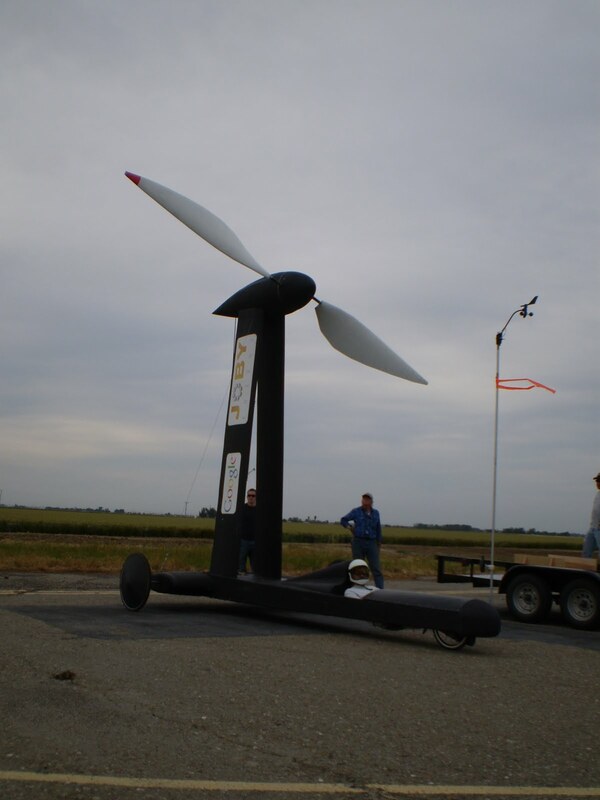 In a recent run at New Jerusalem in Tracy, California, the car reached a top speed of more than 2.85 times faster than the wind blowing at the time (13.5 mph) powered by the wind itself. The run should now settle the DWFTTW (down wind faster than the wind) debate that has been raging for some time on the Internet about whether or not such a feat was possible. At the start, before the car is moving, the wind is coming from behind the car (as you’d expect). 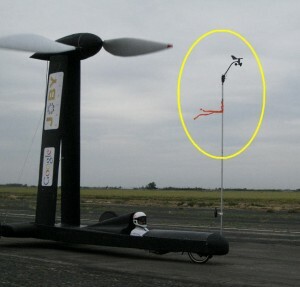 The wind vane / weather vane I’ve circled in the picture is attached to a mast or pole on the front of the car. It points towards the wind… obvious, but look at the next picture. Before the car is moving, the wind is coming from behind the car (as you'd expect). This image, of the car making a “high speed” run is pretty telling… check out the wind direction as indicated by a wind vane (weather vane) and orange ribbon atop a mast attached to the car (yellow circle). Again, the wind vane is pointing towards the wind. 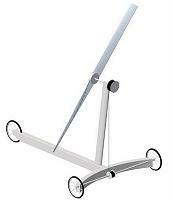 At first the wind vane pointed toward the back of the car. In this picture the vane is pointing forward… meaning that the car is going fast enough that the wind is apparently coming from the front of the car. The car is going faster than the wind blowing at it from behind. 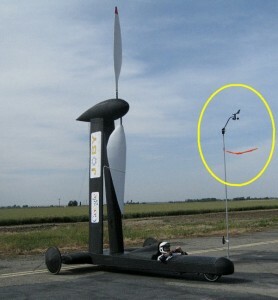 Notice the wind direction as indicated by a wind vane (weather vane) and orange ribbon atop a mast attached to the car (yellow circle). For more pictures and the story of how this vehicle was built and tested see Ride Like the Wind (only faster) at fasterthanthewind.org.